BUDUDA – As the death toll from October 11 landslide in the Eastern Uganda district of Bududa continues to rise, more than 30 people, most of them schoolchildren, remain unaccounted for. By 4.00pm about 41 bodies had been retrieved from the mass of earth that flattened the entire Naposhi trading centre including Tsuume Junior school in Bukalasi sub-county. Reports on the ground indicated that a total of 41 bodies had so far been recovered after devastating mudslides swept villages in eastern Uganda. The mudslides followed heavy rains that lasted for over four hours on Thursday in Bakalasi Sub County in Bududa District. Two market centres of Naposhi and Nalutungu on the slopes of Mt. 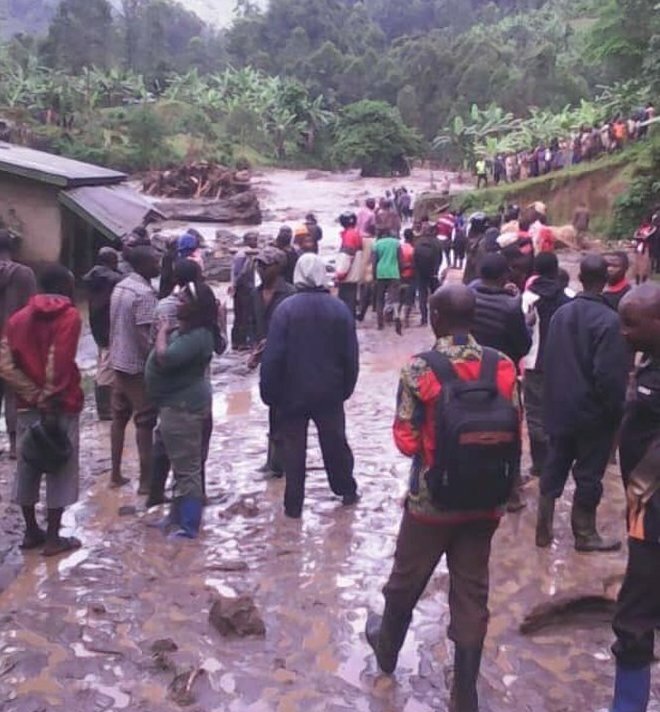 Elgon were competently destroyed when river TSuume in Bukalasi sub-country in the landslide-prone hills burst its banks washing away everything into the larger River Manafwa, killing at least more than 40 residents. Mr Wilson Watira, the Bududa District LCV chairman confirmed the number of landslide victims, saying the search is still ongoing to ensure that the bodies trapped under the rubble are recovered and given a decent burial. “We are happy that police and Red Cross officials have joined us, so far we have managed to recover 41 bodies of people who were killed in the mudslides and some of the bodies recovered have missing parts like limbs or heads,” Mr Watira said. He added that domestic animals, birds, crops, and houses have and not been spared either and that there is looming danger of famine if people are not helped. Yesterday afternoon October 11, tragedy befell Tsuume parish, Bukalasi sub-county in Bududa district when mudslides hit a number of villages following a heavy downpour that lasted over three hours. According to the Uganda Red Cross Society spokesperson Ms Irene Nakasita, survivors have been admitted to Bukalasi Health Centre III with serious injuries. She explained that a team from Red Cross together with police, Office of the Prime Minister and the district disaster management committee are still struggling with the local people to find spme the bodies still trapped under the soaked soils. “We will distribute relief items on Sunday to the affected families as we also continue sensitizing people on effects of climate change. The rains are still continuing in Bududa and neighboring districts,” said Ms Nakasita. The Office of the Prime Minister said a disaster team led by Brig.Steven Oluka had been dispatched to join the district disaster rescue and recovery team ahead of relief supplies including blankets, tents, tarpaulins, jerricans, saucepans and food for the survivors arrive. According to Mr Martin Owor, Commissioner for Disaster Preparedness and Management said about 35 bodies were confirmed dead by yesterday, but that the number was expected to grow. He explained that recovery efforts had been restricted due limited accessibility and navigation in the area as the river ripped off all bridges linking the remote villages to the rest of the district and creating a huge sludge rift separating either sides if the river. “Most of the people were caught at the trading centre, the landslide pushed huge boulders into a river which burst its banks and the water swept away the people,” Mr Owor said. The catastrophe was a surprise to the residents who were going about with their usual chores unaware of the heavy rains within the Mt. Elgon Nation Park that had triggered heavy flooding and mudslides that gained momentum carrying trees and rocks as rolled down the mountain slopes.